A giant,glassy lake larger than North America's Lake Ontario graces the south pole ofSaturn's largest moon Titan, new research confirms. 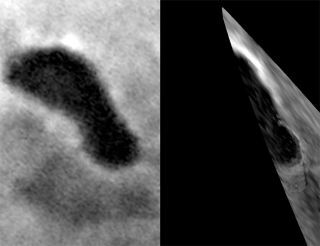 "Thisis the first observation that really pins down that Titan has a surface lakefilled with liquid," said lead researcher Robert Brown of the University of Arizona's Lunar and Planetary Laboratory in Tucson. Called OntarioLacus, the lake extends 150 miles (235 kilometers) and covers an area of about 7,800square miles (20,000 square kilometers). The lake structure is filled mostlywith methane and ethane, hydrocarbons that are gases on Earth but liquid on thebone-chilling surface of Titan. Thefinding, detailed in the July 31 issue of the journal Nature, is justanother gold star for Titan, which has become one of the most fascinatingbodies in the solar system for exploring environments that may giverise to life. Boasting a size that's one-and-a-half times that of Earth'smoon and bigger than Mercury, Titan is the only solar system moon known tosupport a planet-like atmosphere. The idea ofliquid features on Titan is not new. Before the Cassini mission to Saturn,astronomers thought Titan was covered in a global ocean, though thespacecraft's flybys of the moon sucked the life out of that wet notion. Evenstill, evidence for features similar toEarth's lakes and seas, along with telltale signs of erosion from flowingwater, have since come to light. Possibleevidence for lake-like features came from radar images, but this method can'tdistinguish between liquid and very fine gravel or other tiny solids, Brownexplained. "Detectionof liquid ethane in Ontario Lacus confirms a long-held idea that lakes and seasfilled with methane and ethane exist on Titan," said researcher LarrySoderblom of the U.S. Geological Survey in Flagstaff, Ariz.
Soderblom,Brown and their colleagues used the infrared abilities of Cassini's visual andinfrared mapping spectrometer, or VIMS, to peer through Titan's cotton-ball-likeveil of hydrocarbons that extends more than 620 miles (1,000 km) above themoon's surface. Themeasurements showed three features of the lake structure: the shoreline, or theouter edge of the lake; the so-called beach just inside the shoreline, whichcould be a sort of "bathtub ring" of material left behind as theethane mixture evaporated; and the lake's interior, which appears dark, theresearchers say. "Itseems to have partially evaporated, and that makes sense because the south polehas just gone through summer," Brown told SPACE.com. "Themaximum evaporation will have already occurred or is in the process ofoccurring." He added,"There's still a lot of liquid left in that lake, and we don't think it'sgoing to evaporate much further." Plus, thelake feature could be replenished by Titan'sdreary drizzle of methane, which when hit by sunlight breaks down intoethane. As for howthe liquid lake feature would feel if one were to step in, "Liquidethane-methane mix would be less viscous than water," Brown said. "Ifriffling your fingers through it you wouldn't feel as much resistance." The Cassinimission is an international cooperative effort of NASA, the European SpaceAgency (ESA), Italian Space Agency (ASI) and several separate European academicand industrial contributors.